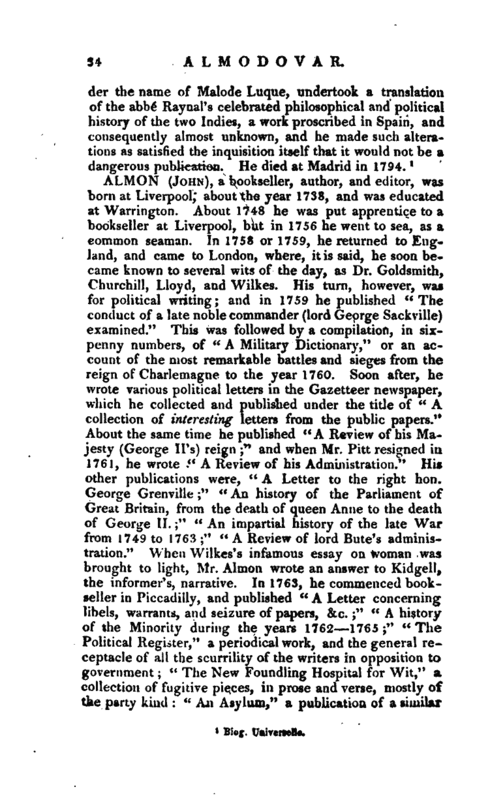 , a bookseller, author, and editor, was born at Liverpool, about the year 1738, and was educated at Warrington. About 1748 he was put apprentice to a bookseller at Liverpool, but in 1756 he went to sea, as a common seaman. In 1758 or 1759, he returned to England, and came to London, where, it is said, he soon became known to several wits of the day, as Dr. Goldsmith, Churchill, Lloyd, and Wilkes. His turn, however, was for political writing; and in 1759 he published “The conduct of a late noble commander (lord George Sackville) examined.” This was followed by a compilation, in sixpenny numbers, of “A Military Dictionary,” or an account of the most remarkable battles and sieges from the reign of Charlemagne to the year 1760. Soon after, he wrote various political letters in the Gazetteer newspaper, which he collected and published under the title of “A collection of interesting letters from the public papers.” About the same time he published “A Review of his Majesty (George II. 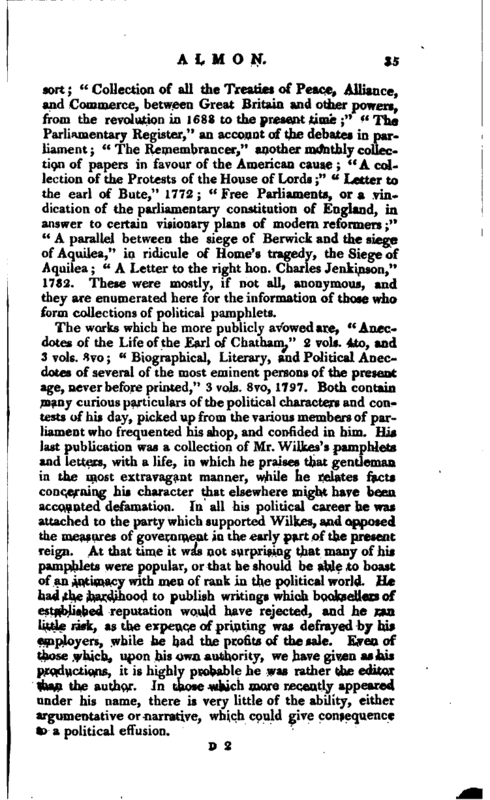 's) reign” and when Mr. Pitt resigned in 1761, he wrote “A Review of his Administration.” His other publications were, “A Letter to the right hon. George Grenville;” “An history of the Parliament of Great Britain, from the death of queen Anne to the death of George II. ;” “An impartial history of the late War from 1749 to 1763;” “A Review of lord Bute’s administration.” When Wilkes’s infamous essay on woman was brought to light, Mr. Almon wrote an answer to Kidgell, the informer’s, narrative. In 1763, he commenced bookseller in Piccadilly, and published “A Letter concerning libels, warrants, and seizure of papers, &c.;” “A history of the Minority during the years 1762 1765;” “The Political Register,” a periodical work, and the general receptacle of all the scurrility of the writers in opposition to government; “The New Foundling Hospital for Wit,” a collection of fugitive pieces, in prose and verse, mostly of the party kind: “An Asylum,” a publication of a similar | sort; “Collection of all the Treaties of Peace, Alliance, and Commerce, between Great Britain and other powers, from the revolution in 1688 to the present time;” “The Parliamentary Register,” an account of the debates in parliament; “The Remembrancer,” another monthly collection of papers in favour of the American cause; “A collection of the Protests of the House of Lords;” “Letter to the earl of Bute,” 1772; “Free Parliaments, or a vindication of the parliamentary constitution of England, in answer to certain visionary plans of modern reformers;” “A parallel between the siege of Berwick and the siege of Aquilea,” in ridicule of Home’s tragedy, the Siege of Aquilea; “A Letter to the right hon. Charles Jenkinson,” 1782. These were mostly, if not all, anonymous, and they are enumerated here for the information of those who form collections of political pamphlets. Gent. Mag. vol. 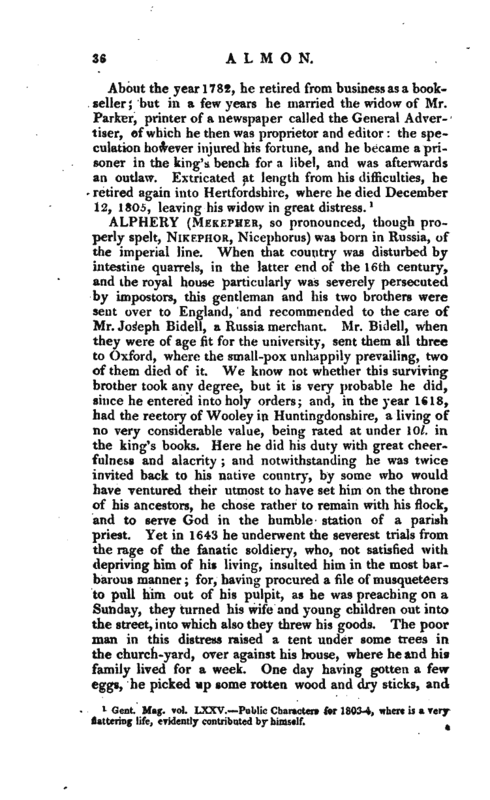 LXXV.—Public Characters for 1803-4, where is a very flattering life, evidently contributed by himself.